AudioQuest and DragonFly designer Gordon Rankin worked alongside Microchip Technology to develop a new high-performance, full-speed USB microcontroller solution that delivers improved signal-to-noise ratio and significantly lower power consumption. Drawing 77% less current than the previous microcontroller, the new Microchip PIC32MX microcontroller enables true compatibility with Apple and Android smartphones and tablets. Further, we simply cannot overstate the significance of Gordon Rankin’s contributions to AudioQuest. The new DragonFly models embody many of Gordon’s most innovative, creative, and elegant digital-audio solutions to date. Is it just me, or does anyone else think Microchip probably didn't need to collaborate with an outfit like Audioquest to design a new microcontroller? Reduces the noise and ringing that plague both the data and power lines of USB ports. Measurably reduces jitter, unwanted noise currents, and parasitic resonances. Packet errors are sometimes eliminated completely. Improves dynamic contrast, warmth, and resolution. And there's this gem: "Use an additional JitterBug in parallel for improved playback performance." As in, "plug a second one into the empty USB socket next to the socket you're using for your DAC, which is connected through a Jitterbug." And: "Use JitterBug with other locally connected USB devices, such as hard drives, printers, and cameras, to effectively reduce audio interference." 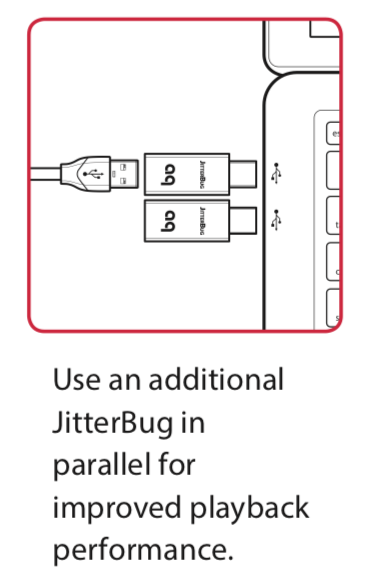 And: "Use JitterBug with USB-enabled network devices, such as routers, NAS devices, and streamers." Very important to filter that USB port on the router that you're not using. It's small enough that I wonder if there's anything in it at all. or maybe galvanic isolation ? it's usefull for reducing any EMI / RF. don't know about jitter though. PIC32MX is a general purpose type microcontroller family and was introduced quite a few years ago. I'm surprised they didn't use a PIC32MZ for USB 2.0 and 192kHz support. I suspect they will show an effect only if your existing filter caps are already too dried-out to be of much use. If you read carefully, the quote does not say that Microchip got any input from Gordon Rankin and Audioquest. Gordon worked "alongside Microchip", which seems to mean that he used their new chip in his circuit design. The new PIC draws 77% less current (but Gordon presumably had nothing to do with that), and Gordon made "significant contributions to AudioQuest" (but probably none to Microchip). L(? )C decoupling on the power lines and a common mode choke on the data lines. As the product is not new, there's discussion aplenty on it online. I wonder if Microchip appreciates being mentioned in this context at all. I.e. he was so out of his depth that he had to continually pester Microchip's FAE's to get a working product. Translation: he posted a question on their forum once. Or he parked his car outside their building, drew a doodle and called it "work". Galvanic isolation is absolutely not useful for reducing EMI! Facts and specifications will not stop an audiofool company. I hear all sorts of noises from different sound cards but they don't seem to bother me that much. Sometimes it can be quite soothing.